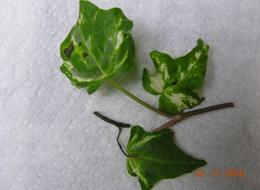 Symptoms: (see photo 1 & 2 below) Often older leaves are the first to show symptoms. The leaf spots are at first light green in color and have a water-soaked appearance. Later they turn brown or black and often have a reddish margin. When veins become infected, the whole leaf often dies. This disease also causes cankers on the stems and when they are girdled, the whole shoot dies back. When the weather is warm and moist, bacterial ooze is sometimes present on the affected tissue. 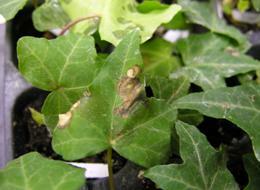 Pathogen cycle: Bacterial leaf spot occurs during moist, humid weather. The bacterium is spread about in splashing water, and requires wounds to infect. These wounds can be natural openings, such as stomates, or mechanical wounds from insect feeding or pruning. Management: Prune out dead and dying shoots, but otherwise avoid wounding the tissue since bacteria need wounds for infection. Avoid overhead irrigation or irrigate when foliage will dry quickly. Copper fungicides work well for bacterial diseases, but can cause phytotoxicity if used improperly. Read and follow all label directions.